Today we have news of the impending demise of one of the higher-profile projects. The ZX Vega+ is a handheld Sinclair Spectrum console bearing the Sinclair name that came with an impeccable pedigree in that it had the support of the man himself. It seemed like a good proposition on the crowdfunding site Indiegogo, and when it made its debut there in early 2016 it attracted over half a million pounds worth of backing in short order. Things soon went sour though, with reports of a falling-out within Retro Computers, followed by multiple missed deadlines and promises undelivered over the last couple of years. With little sign of either the money or the console itself, it seems Indiegogo have now lost patience and will be sending in the debt collectors to recover what they can. Whether the backers will see any of their money is unclear. It’s fair to say that the ZX Vega saga has been a tortuous and rather sordid one, out of which few players emerge smelling of roses. In a way though it is entirely in keeping with the spirit of the 8-bit era, as the period from the late 1970s onwards was littered with the financially bare corpses of dubiously run companies in the home computer industry. Meanwhile if you are hankering for a Vega it should be easy enough to create one for yourself, as Retro Computers Ltd admitted that under its skin was a copy of the FUSE software emulator. We suspect that most Hackaday readers could take a Raspberry Pi and a suitable LCD, pair them with a 3D-printed case and an 18650 cell, and be playing Manic Miner in no time. Far simpler than this convoluted Spectrum project! Kickstarter is not a store. Indiegogo is not a store. Crowdfunding is not buying something — you’re merely donating some money, and you might get a reward for your pledge. Caveat emptor doesn’t apply, because there is no buyer, and no one can figure out what the correct Latin translation for ‘backer’ is. These are the realities that have kept Indiegogo and Kickstarter in business, have caused much distress in people who think otherwise, and have been the source of so, so many crowdfunding follies. Now, finally, crowdfunding is being legally recognized as a store. The Register reports a court in England has ruled against Retro Computers Ltd and said it had formed a contract of sale with crowdfunding backer Rob Morton. For one person, at least, for one of their pledges, Indiegogo is a store. The crowdfunding campaign in question is the Retro Computers’ Sinclair ZX Spectrum Vega Plus, a small device not unlike the Commodore 64 direct to TV joysticks. The Spectrum Vega simply plugs into your TV, reads an SD card, and plays old ‘speccy games. Clive Sinclair, the genius who brought us the Spectrum, strange flat CRTs, and a host of other inventions, was involved in this campaign. In the years since the campaign ended, there have been numerous updates and Retro Computers still says they intend to deliver the device. Morton, apparently fed up with the delays, brought a suit against Retro Computers for the grand sum of £584: £85 for the Spectrum pledge, £5 for shipping, and the remainder for travel expenses and lost wages for the court date. District Judge Clarke of Luton County Court heard the case and ruled against Retro Computers, finding there was a contract of sale between Morton and Retro Computers Ltd.. Evidence included a number of copies of Morton’s order, a document the judge pointed out as saying ‘this order’ and not ‘this pledge’. Additionally, the judge found the fine print on Indiegogo does not negate a contract of sale; there was still an implied agreement between Morton and Retro Computers, and Retro Computers had breached the contract by not delivering a Spectrum. It should go without saying that this finding does not apply to every project on Indiegogo, it does not apply to Kickstarter, and nor does it apply to every crowdfunding campaign. This does not even apply to all backers of the Spectrum Vega Plus. Still, there are hundreds of thousands of backers for crowdfunding projects that haven’t received what they paid for, and if nothing else this story gives just a little bit of satisfaction to anyone that’s still waiting on an undelivered product. Around this time last year, Monoprice quietly unveiled a small, $200 3D printer. At the time, a fully functioning printer at this price point wasn’t unheard of. A good 3D printer at this price point was. It turned out this printer was actually fantastic and completely changed the value proposition of desktop 3D printers. In the year since the release of the MP Select Mini printer, Monoprice has been hard at work bringing costs down, reworking designs, and creating an even less expensive printer. Now, it’s out. It’s available for pre-order on Indiegogo right now. Is this still a $150 printer? Not quite: the ‘early bird’ price is $159 with free shipping and August delivery, and a regular price of $169 plus $10 shipping with September or October delivery. There’s also a bundle for $279 that includes the printer, 2kg of filament, and a software package. The first time we saw this tiny printer was way back in January at CES. It looked to be an extremely capable printer; the only question was if Monoprice could produce it and get it out the door. This would be a tall order; this printer comes with NEMA 17 stepper motors, a heated bed, a 32-bit controller board, and has WiFi enabled. Here’s what we know about the capabilities of this printer. It’s a fairly standard delta printer with Bowden extruder and a heated bed. PLA and ABS is supported. The printer has auto bed leveling that measures the bed by ‘tapping’ the nozzle against the bed in about a dozen places before printing. From what we saw at CES, the hot end appears similar to the first revision of the $200 MP Select Mini — possibly opening up the door to E3D hot end installations. Is this printer worth it? Every 3D printer released on a crowdfunding platform should come with the standard warnings, but Monoprice says this machine is in production right now. This raises the question: why release it on Indiegogo when Monoprice already has the whole ‘taking orders for products online’ thing in the bag? I suspect this crowdfunding campaign is just building a buffer; a year ago, the MP Select Mini was perpetually out of stock, and demand far outstripped supply. The same thing will happen with a 3D printer that’s even deeper into impulse buy territory. In any event, the printer we’ve all been waiting for has been ‘released’, for varying values of ‘released’. The first units will start making their way onto desktops this summer, and we’re going to pick one up and put it through its paces. You can check out Monoprice’s video of this printer below. Wireless power transfer exists right now, but it’s not as cool as Tesla’s Wardenclyffe tower and it’s not as stupid as an OSHA-unapproved ultrasonic power transfer system. Wireless power transfer today is a Qi charger for your phone. It’s low power – just a few amps — and very short range. This makes sense; after all, we’re dealing with the inverse square law here, and wireless power transfer isn’t very efficient. Now, suddenly, we can transfer nearly two kilowatts wirelessly to electronic baubles scattered all over a room. It’s a project from Disney Research, it’s coming out of Columbia University, it’s just been published in PLOS one, and inexplicably it’s also an Indiegogo campaign. Somehow or another, the stars have aligned and 2017 is the year of wirelessly powering your laptop. The first instance of wireless power transfer that’s more than just charging a phone comes from Disney Research. This paper describes quasistatic cavity resonance (QSCR) to transfer up to 1900 Watts to a coil across a room. In an experimental demonstration, this QSCR can power small receivers scattered around a 50 square meter room with efficiencies ranging from 40% to 95%. In short, the abstract for this paper promises a safe, efficient wireless power transfer that completely removes the need for wall outlets. In practice, the QSCR from Disney Research takes the form of a copper pole situated in the center of a room with the walls, ceiling, and floor clad in aluminum. This copper pole isn’t continuous from floor to ceiling – it’s made of two segments, connected by capacitors. When enough RF energy is dumped into this pole, power can be extracted from a coil of wire. The video below does a good job of walking you through the setup. As with all wireless power transmission schemes, there is the question of safety. Using finite element analysis, the Disney team found this room was safe, even for people with pacemakers and other implanted electronics. The team successfully installed lamps, fans, and a remote-controlled car in this room, all powered wirelessly with three coils oriented orthogonally to each other. The discussion goes on to mention this setup can be used to charge mobile phones, although we’re not sure if charging a phone in a Faraday cage makes sense. If the project from Disney research isn’t enough, here’s the MotherBox, a completely unrelated Indiegogo campaign that was launched this week. This isn’t just any crowdfunding campaign; this work comes straight out of Columbia University and has been certified by Arrow Electronics. This is, by all accounts, a legitimate thing. The MotherBox crowdfunding campaign promises true wireless charging. They’re not going for a lot of power here – the campaign only promises enough to charge your phone – but it does it at a distance of up to twenty inches. At the heart of the MotherBox is a set of three coils oriented perpendicular to each other. The argument, or sales pitch, says current wireless chargers only work because the magnetic fields are oriented to each other. The coil in the phone case is parallel to the coil in the charging mat, for instance. With three coils arranged perpendicular to each other, the MotherBox allows for ‘three-dimensional charging’. Does the MotherBox work? Well, if you dump enough energy into a coil, something is going to happen. The data for the expected charging ranges versus power delivered is reasonably linear, although that doesn’t quite make sense in a three-dimensional universe. Is it finally time to get rid of all those clumsy wall outlets? No, not quite yet. 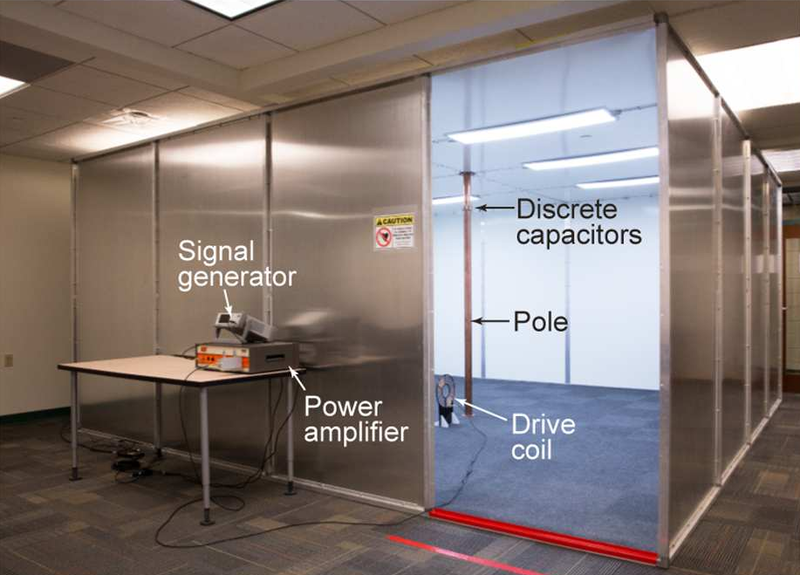 The system from Disney Research works, but you have to charge your phone in a Faraday cage. It would be a great environment to test autonomous quadcopters, though. For MotherBox, Ivy League engineers started a crowdfunding campaign instead of writing a paper or selling the idea to an established company. It may not be time to buy a phone case so you can charge your phone wirelessly at Starbucks, but at least people are working on the problem. This time around, some of the tech actually works. Crowdfunding site Indiegogo has partnered with equity crowdfunding startup Microventures to allow anyone to invest in startups. The comment sections of crowdfunding sites are almost as bad as YouTube. For every crowdfunding campaign that ships on time, you’ll find dozens that don’t. Thousands of people are angry their Bluetooth-enabled Kitten Mittens won’t be delivered before Christmas. Deep in the comments for these ill-conceived projects, you’ll find a common thread. The backers of these projects invested, and they demand a return. This, of course, is idiotic. Backing a project on Indiegogo or Kickstarter isn’t an investment. It is effectively burning money with the hope Kitten Mittens will eventually show up in your mailbox. Until now. For an actual investment, there are regulations that must be met. The groundwork for this appeared last year when the Securities and Exchange Commission (SEC) introduced rules for equity crowdfunding. These rules include limitations on how much an individual may invest per year (a maximum of $2,000 or 5% of income, whichever is greater, for individuals with an income less than $100,000 per year), how much money these companies can raise ($1M in a 12-month period), and how an individual can invest in these companies. Right now, the startups shown on Indiegogo and Microventures include an MMORPG, a distillery and cocktail bar in Washington, DC, a ‘social marketplace for music collaboration’, and a Bluetooth-enabled supercapacitor-powered “Gameball™”. All of these projects actually have documentation, and while the legitimacy of each crowdfunding project is highly dependent on the individual investor, there is a lot more data here than your traditional Indiegogo campaign. This isn’t fire and brimstone and physics-defying electronic baubles raining down on the common investor, as you would expect from a traditional crowdfunding site tapping into the SEC rules on equity crowdfunding. This is, after all, only a partnership between Indiegogo and Microventures, one of the investment ‘funding portals’ that grew out of the equity crowdfunding regulations. In short, putting an investment opportunity up on Indiegogo will require more effort than a project that is just a few renders of a feature-packed smartphone or a video game with stolen assets. If anything, this is just the continuation of what we’ve had for the past year. Since the SEC released the final regulations for equity crowdfunding, there have been a number of startups wanting to get in on the action. This partnership between Microventures and Indiegogo was perhaps inevitable, and we can only wonder who Kickstarter is about to team up with. Kickstarter, Indiegogo, and every other crowdfunding site out there frequently have projects that should never be products. The latest promises to protect you from security breaches and identity theft by blowing up your computer. It’s the USB Killer, and for only $99 USD, you too can destroy the USB port in your computer and everything else attached to it. The USB Killer is a device that plugs into the USB port on any computer, charges up several caps, and dumps all that voltage back into the computer. The process repeats until something breaks. We’ve seen it used on a poor Thinkpad X60, and from the video evidence it does exactly what it’s designed to do: kill a computer.